Ever wonder how deer and turkey maneuver around dense thickets and steep ridges or how game fish travel from feeding areas to sanctuaries? If so, Up-Close Outfitters has developed advanced maps to display these geographic patterns. These water-proof maps are essential for in the field and pre-season scouting. They help show funnels, feeding areas, cliffs, different type of vegetation, trails, rocky outcrops, and give a bird’s eye to the woods or lake of interest. Up-Close Outfitters utilizes Aerial Photography, False Color Aerial Photography, Satellite Imagery, Elevation Models, in the field GPS data, Side-Scan Imagery, custom Bathometric data, and a vast network of geographic information to help plan and predict game travel. In addition to these scouting tools we guide for Deer, Turkey, Bass, Trout, and Striper in the same regions our maps are produced thus testing each maps for reliability. 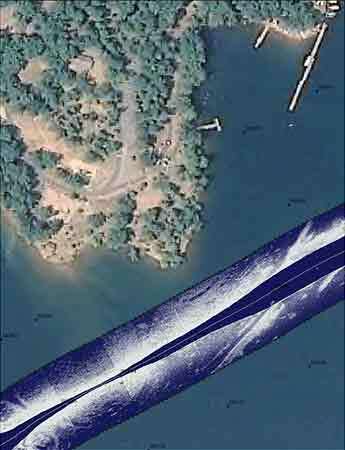 Our bathometric maps are produced using state of the art Hypack Survey software installed on our Champion Boat. We collect X,Y,Z points in a grid format on local lakes in NC and SC. Using multiple software platforms, including GIS, we develop highly detailed maps for fishermen to study the bottom composition. These maps are displayed in a graduated color scheme to display the smallest change is depth. You will never want to look at a contour map again. These maps help in predicting Walleye, Bass, Trout, and Striper migrations. A majority of the lakes we map have never been mapped before. The new technology of Side-Scan has enabled anglers to see the bottom of a lake in a new light. Several years ago, Humminbird came out with side-scan technology. With the help of the Georgia Department of Natural Resources Wildlife Resource Division, Up-Close Outfitters has developed an innovative method for linking side-scan images to a geographic location. By using multiple echo sounders, covering an area of 180 degrees, we are able to take black and white pictures of the bottom. When put together, these images result in an uninterrupted and detailed picture of the lake bottom. With a little practice you can become an expert at reading these images and routinely pinpoint trout, bass, walleye, and striper habitat. The customization does not stop here. All our maps are printed on high-quality Tyvec waterproof paper. Each map is available in a variety of sizes from 18” by 24” to a huge 36” x 48”. We display features in full color to highlight even the slightest change in depth. When combined with aerial photography on the outside border, they almost come alive. Up-Close Outfitters LLC. is proud to announce a new series of hill-shade and slope hybrid hunting maps. We’ve blended a colorful representation displaying the slope of the mountain terrain with a shaded relief map giving off a remarkable 3D representation. 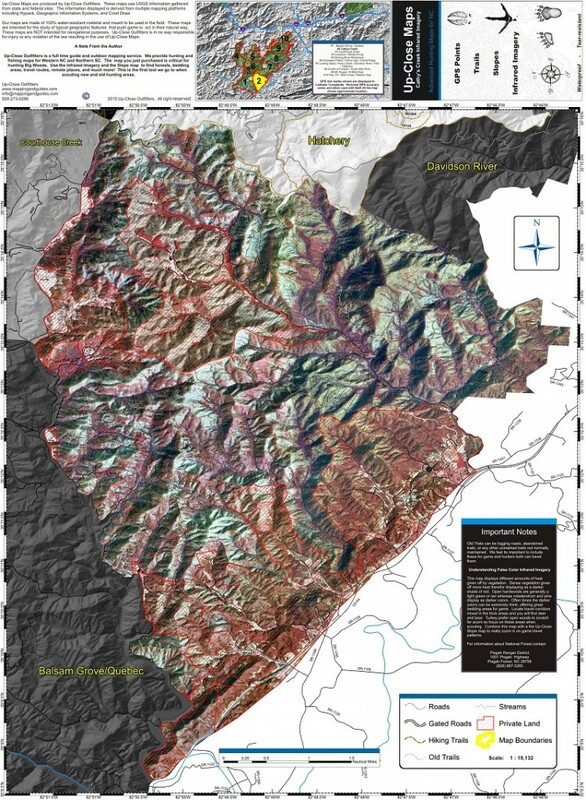 Our hunting maps use the best in elevation data displaying stunning visual representations. Figuring out how deer travel in the mountain terrain of the National Forest in western North Carolina is a difficult proposition for even the most experienced hunters. The grade of a slope plays a huge factor on how game travel throughout their home range and it takes years of exploring to figure this out. Fortunately now, Up-Close Outfitters has developed very specific hunting maps designed to give away the natural funnels that game travel. These easy to interpret maps are displayed with a full graduated color scheme that makes subtle changes stand out. With this colorful representation draped over a hill-shade layer the visual effect gives off a remarkable 3D appearance. Each map is fully integrated with GPS grids for easy coordinate uploads to your handheld GPS device. They also include other handy features for ground navigation, such as National Forest trails, roads, and an accurate scale bar to help plan distances covered per hunt. All federal and state assigned travel routes are named and labeled for easy reference to National Forest signs. All serious outdoorsmen know the importance of maps for preseason scouting. We strongly believe our maps are the best on the market. Our maps are divided into ideal sized blocks of National Forest covering anywhere from 3-8 square miles of terrain. Zoom in to funnels and converging trails for deer. These hunting maps are specifically printed to withstand what ever Mother Nature throws at you. They are fully water-proof and printed on a Tyvek-like synthetic paper, which is extremely durable. Sportsmen can fold them up into a 9” by 4” size that fits easily into a hunting vest. Combine this map with our Color Infrared Maps Hunting Maps and you will have the ultimate scouting resources. Ever wonder how deer and turkeys navigate in thick areas of rhododendron and mountain laurel? Discerning their patterns in this thick habitat is a difficult proposition for even the most experienced sportsmen. Hunters have learned that deer travel natural barriers to and from bedding areas. Natural funnels on the edge of these thickets are a buck’s number one travel route. With our National Forest maps you can now zoom right in on their highways. Up-Close Outfitters has developed color infrared maps to assist hunters in locating deer and turkey in the most challenging mountain landscapes. Our maps combine new and old false color infrared imagery to display the vegetation thickness and physical features of mountain terrain. This technology records open hardwoods and thick vegetation at different wave lengths. Our maps display thick vegetation in dark red and open hardwoods in a light brown. Our maps make scouting and traveling through the vast National Forests much easier. Use these maps to find wildlife funnels, bedding areas, white pine stands, and hardwood stands in seconds. We can also combine these maps with our hill-shade / slope hybrid maps to create the perfect do-it-yourself guide for pre-season scouting. Our maps are divided into ideal sized blocks of National Forest covering anywhere from 3-8 square miles of terrain. Zoom in to pinpoint turkey flocks or traveling routes for deer. These hunting maps are specifically printed to withstand what ever Mother Nature throws at you. They are fully water-proof and printed on a Tyvek-like synthetic paper, which is extremely durable. Sportsmen can fold them up into a 9” by 4” size that fits easily into a hunting vest. A brilliant combination of hillshade and slope combined to form a seamless hybrid map. Great color and texture illuminate steep slopes and travel corridors for Deer and Tukey. Essential for Big Woods pre-season scouting. See the Slope only map for a full description! 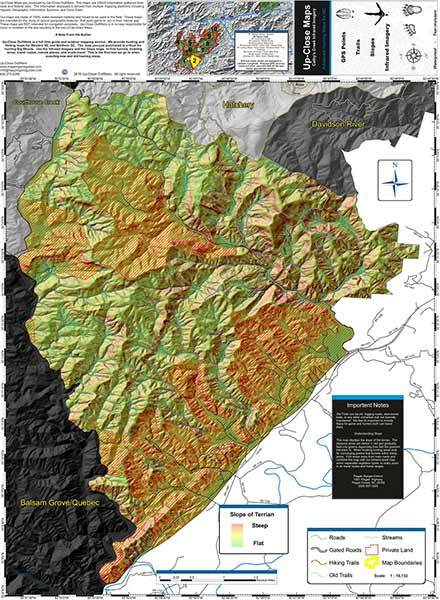 Custom high resolution National Forest maps displaying open hardwoods and thick vegetation. Ideal for pre-season scouting of Deer and Turkey. Folded and waterproof for easy field navigation. See the Infrared only map for full description!